I kept the last few posts from documentary filmmaker Errol Morris’ New York Times blog starred but unread in Google Reader for a couple of weeks. The summaries sounded intriguing, but I was busy finishing up Masters stuff, and each post is a couple of thousand words long. Tonight I finally got around to reading them, and, of course, here I am to rave about how fantastic they are. I’m a fan of his films already (I wrote about a scene from Gates of Heaven last year) and am looking forward to his forthcoming one about the photographs of prisoner abuse that came out of Abu Ghraib prison, Standard Operating Procedure. In the run up to that, he has been writing on his blog about the nature of photography and the truths that we expect photos to represent, particularly in relation to war photography. Not surprisingly many of the canonical images of early war photography turn out to have been staged, or to have had their subjects tampered with. 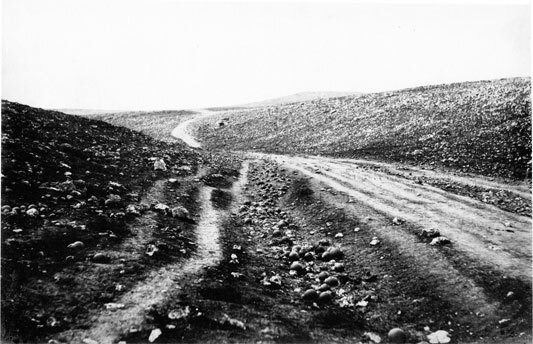 After reaching the much shelled valley approaching Sebastopol in his horse-drawn darkroom, Fenton made two exposures from the same tripod position: in the first version of the celebrated photo he was to call â€œThe Valley of the Shadow of Deathâ€ (despite the title, it was not across this landscape, that the Light Brigade made its doomed charge), the cannonballs are thick on the ground to the left of the road, but before taking the second picture â€“ the one that is always reproduced â€“ he oversaw the scattering of the cannonballs on the road itself. The question is, why the disparity between the two photos? 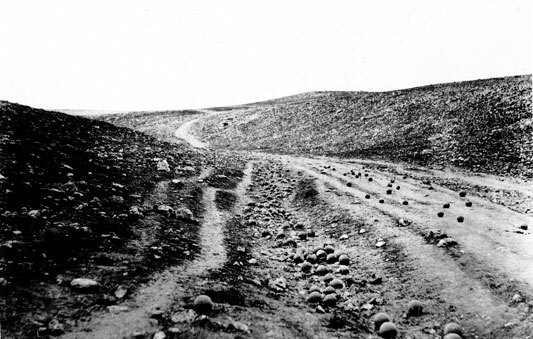 Mustn’t Fenton have planted the cannonballs on the road before the second shot to make the photo more dramatic? I’m at risk of simply paraphrasing Morris’ entire entry here, so I’ll stop now. Suffice to say that he’s not happy to just accept the conventional wisdom that Fenton planted the cannonballs for dramatic effect, and sets about doing some detective work. What follows is a modest but absolutely compelling investigation. Seriously, go read it. What I really love about this is that he has taken what might be a mildly interesting topic – I wonder if this photo was staged or not? – and delved so deeply into it that it becomes infectiously fascinating. After reading the first entry I spent half an hour following up some of the various ideas that had occurred to me while reading the post that I thought could crack the case (for the record, I’m an anti-staged guy; check out this comparison of the high-resolution images that I did to see why). After a little over three weeks, the first entry alone is pushing nine hundred comments, so it looks like I wasn’t alone. To finish, some video links: A Brief History of Errol Morris, a documentary about the filmmaker himself; Morris and Robert McNamara on the Charlie Rose show, most notable for how strongly Morris disagrees with McNamara, something that didn’t come across in The Fog of War. The Florence Rasmussen bit from Gates of Heaven used to be on YouTube, but it appears to be gone again. I’m kind of glad; some things just need to be seen in their original context.